I love pineapples. They are so sweet and the fruit makes great salsas. It’s wonderful grilled with a barbecue too. 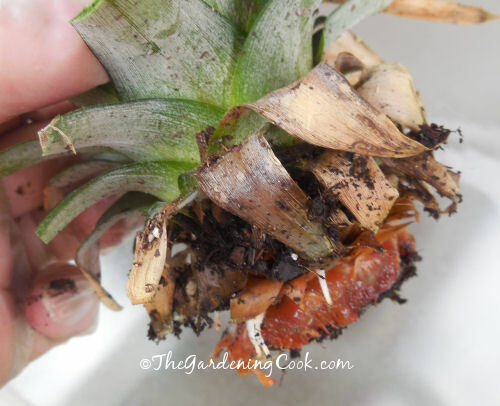 Did you know that growing pineapples from a discarded top is quite easy to do? And one of the beauties of this project is that, if you don’t have room for a full scale vegetable garden, pineapples will grow in pots on a patio! 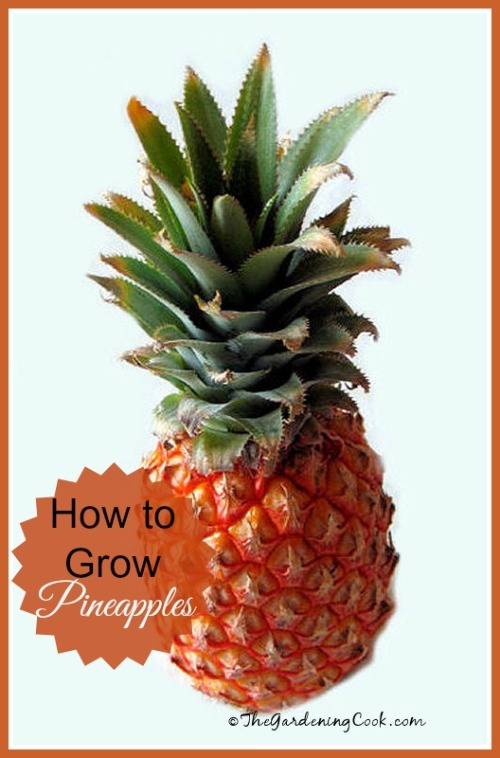 Growing Pineapples is easy to do and a fun project for the kids. 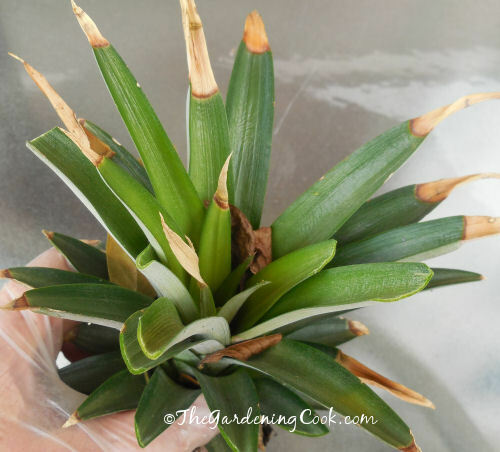 Growing pineapples is an easy DIY project that the kids will really love. They are a member of the cut and come again family which will regrow from the original fruit or vegetable. Start by choosing a good looking pineapple. Cut of the base of the pineapple leaving about 1 inch or less of the fruit. It’s important to leave some fruit for it to sprout. When I cut the bottom off, I always trim the pineapple and store the fruit in the fridge for it to keep. Don’t worry if the top of the pineapple has some yellow edges. I trimmed mine when I planted it and it is looking fine now. The roots will grow in just a few weeks! After a few weeks in the pot, this is what my pineapple crown looked like. It has already started to grow roots. At this stage, I moved my pineapple plant to a planter with other plants with normal potting soil. 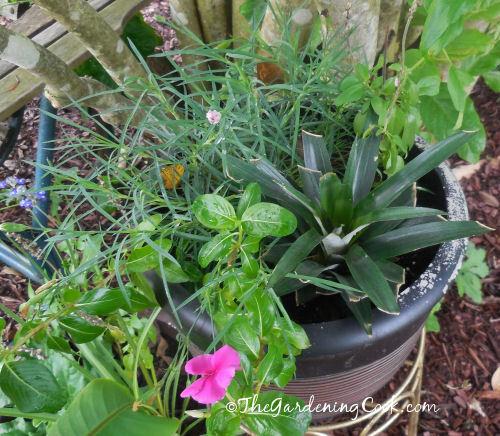 (affiliate link) The other plants in the container are annuals and will die down in the winter, but I will bring the planter inside with just the pineapple in it. 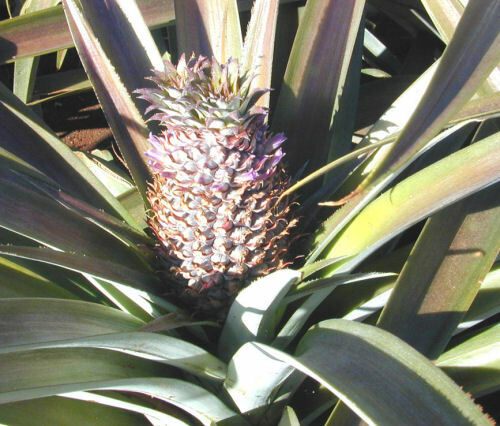 By next year, the pineapple will occupy its own container but for now it has other plants around it while it grows. In a few months, you will have lots of healthy growth. After a couple of months, the pineapple top has increased in size with new healthy growth showing. It is important to be patient as you wait for the pineapples to form. It will be several seasons before fruit will form. At some point the pineapple will flower. This is a great milestone, since it shows that the fruit will be coming soon. The fruit is actually the small part below the showy brachts of the flower. Patience is a virtue with pineapples. 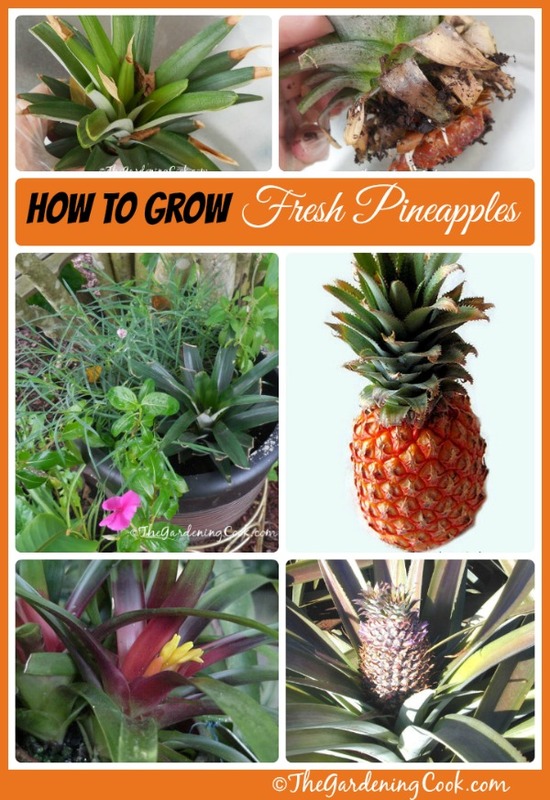 It may take 2 or 3 years for your home grown plant to produce a pineapple. Once the fruit has formed, let it get ripe on the plant. (store bought ones get ripe in the store.) Your plant will be sweeter if it sweetens on the plant itself. This one is unripe. 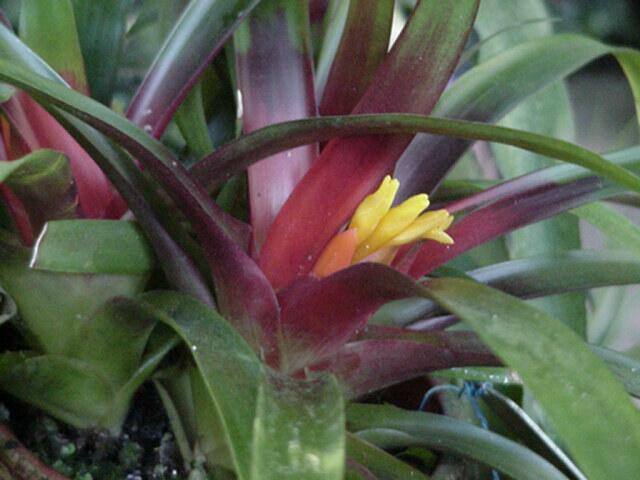 Let the outside of the plant go from brown to yellow before removing it from the plant. Finally – the time has come! Be sure to save your top to increase your family of pineapple plants. They will grow in the garden in warmer zones but will need to come inside for the winter in colder climates. 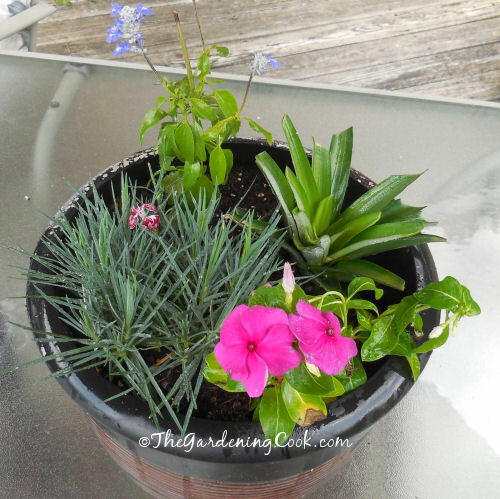 For more great gardening ideas and tips please visit my GardeningCook page on Facebook. I love this information and plan on using it. I would like to have something nice to pass down to my adult children that they can pass on to theirs. I have 2 pineaple plants going, do they prefer being in a smaller more compact container or a larger one..? Hi, I saw on Pinterest that you should put the pineapple top in water to root it first . Should I do that and then plant in soil ?